Jack and his friends are at the local Harvest Fair where Jack is unable to resist eating things from the Harvest Table! Most of the children realise how lucky they are to have so much, when others in the world are not so fortunate. By contrast, Jack is more interested in feeding his own stomach and listening to the comedians. Eventually, after some persuading, he's ready to suggest how they might help others to help themselves. "Brilliant! The children revelled in this entertaining and emotive presentatation. 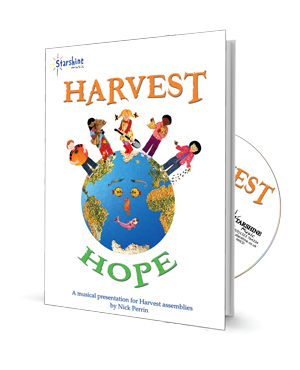 With catchy songs and simple folk dance 'Harvest Hope' provided everyone with much food for thought!" - S. Gough, Headteacher, E Sussex. 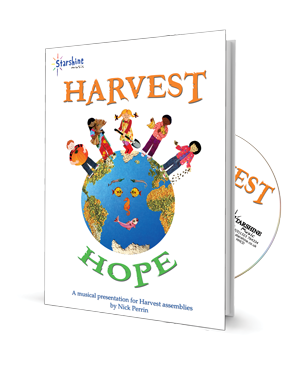 FREE Harvest word-searches and crossword - see cast list tab below.